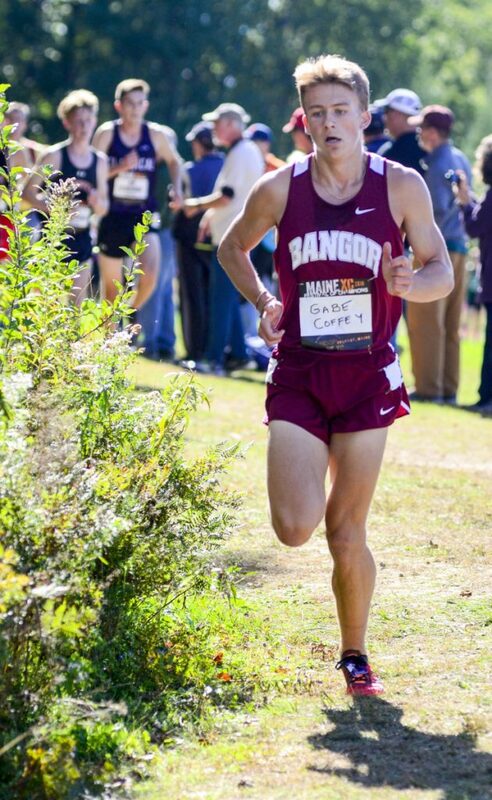 Bangor's Gabe Coffey and Falmouth's Sofie Matson take home individual titles. 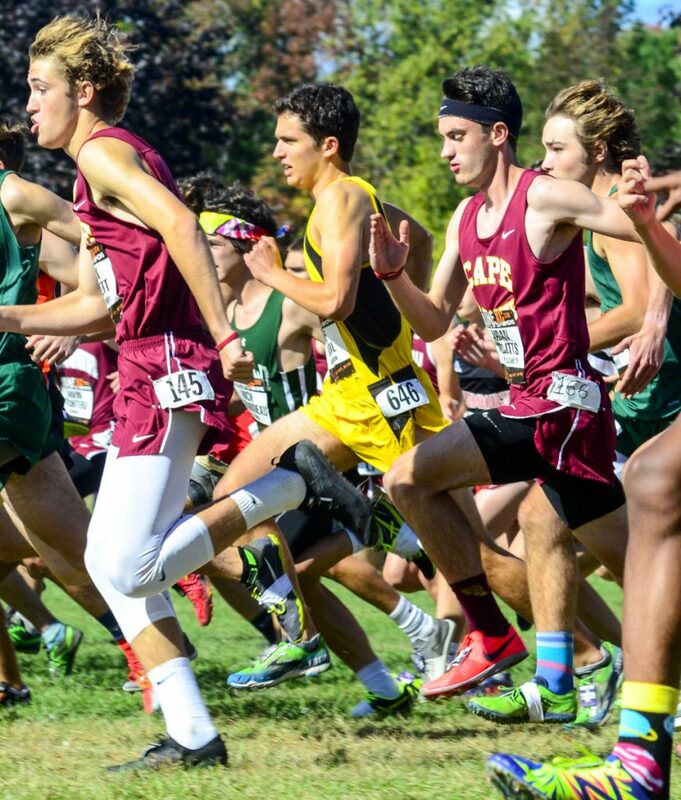 BELFAST — When Rhode Island runners Joe O’Rourke and Andrew McClure came through the first-mile marker at the Festival of Champions cross country race neck and neck and with a 10-second lead over Bangor’s Gabe Coffey and the rest of the pack, Coffey thought his chances at winning were out the window. Staff photo by Joe Phelan Boys in the seeded race take off from the starting line in the Festival of Champions on Saturday in Belfast. Staff photo by Joe Phelan Maranacook's Luke Bartol, 646 center, starts the Festival of Champions on Saturday in Belfast. He finished 27th with a 17:09.58. Staff photo by Joe Phelan Bangor's Gabe Coffey won the Festival of Champions in 15:54.51 on Saturday in Belfast. McClure, of Burrillville High School, fell off the pace by the second-mile mark and it was O’Rourke (Classical High School) and Coffey who were neck and neck, while Brunswick’s Will Shaughnessy, Falmouth’s John Auer and Scarborough’s Tristram Coffin were all close behind when the lead pack crossed the two-mile line. Coffey, though, emerged victorious with a time of 15:54, eight seconds faster than Auer and 10 faster than Shaughnessy. Coffey took off at the two-mile mark and never looked back. The competition of not just runners from out-of-state but also his friends from all over Maine helped fuel the senior’s fast time. For Shaughnessy, Festival of Champions was a warm-up of sorts and also a gauge to test where his times are heading into the bigger meets. It turns out that the junior is ahead of schedule. Coffin finished in fifth with a time of 16:06. While Coffey won the race, the Rams came in second to Brunswick in the boys team title race. Scarborough finished third. The story of the girls race was who was going to challenge Sofie Matson of Falmouth for the title. Matson won as a freshman in 2017 by 19 seconds. This year was much of the same, to a degree. Matson took off early and carried a strong lead throughout. She had a nine-second lead at the first mile and a 14-second lead at the second mile, and went on to win with a time of 18:21, four seconds slower than her freshman year. However, Jillian Richardson of Edward Little stayed nearby throughout. Richardson battled at the beginning with Gorham’s Kate Tugman in pursuit of Matson. Richardson pulled away and was in sole possession of second place at the second mile but didn’t have enough real estate to catch Matson at the end, finishing in 18:29. Ami Beaumier of Bonny Eagle finished in third with a time of 18:45, leading Bonny Eagle to a first-place team finish. Tugman ended the race in ninth with a time of 19:02. Mt. Blue’s Kahryn Cullenberg finished in 16th place with a personal best time of 19:33.